COLUMBIA, Mo 9/9/14 (Beat Byte) -- The city's largest officially-sanctioned leadership group -- the Downtown Columbia Leadership Council (DCLC) -- has uncovered a City Charter/City ordinance violation that involves millions of dollars gone missing from a special fund to replace aging infrastructure. The group has made the Charter/ordinance requirement to "establish and appropriately fund a Depreciation Fund" a cornerstone of a 15-part Insfrastructure Report prepared at the request of Mayor Bob McDavid and the Columbia City Council. Despite the legal mandates, neither the Council nor the city manager has ever established a Depreciation Fund, DCLC members discovered. Instead, surplus city utility monies -- aka "profits" in the private sector -- flow into so-called "Unrestricted Funds" available for any purpose. 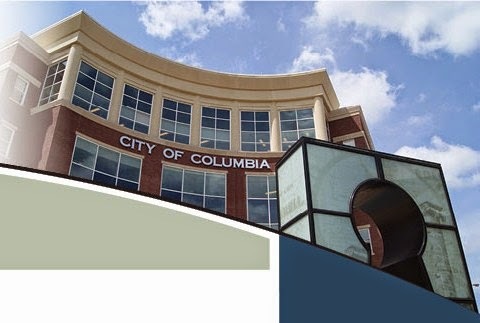 Columbia's three major utilities -- water, electric, and sewer -- had over $85 million in their Unrestricted Funds as of 2013 -- more than enough to pay for some $50 million in identified infrastructure replacements. "The City Council shall provide and maintain an adequate Depreciation Fund for the purpose of making renewals and replacements," Section 102 of the City Charter -- Columbia's guiding constitution -- mandates for water, electric, and related infrastructure. "Payments from the revenues of said water and electric light works shall be made into the depreciation fund monthly....Said depreciation fund shall be expended only for making renewals and replacements...or unusual and extraordinary repairs." Titled "The Water and Electric Depreciation Fund," Columbia city ordinance 27-44 reiterates the requirement. "There is hereby created a fund known as the 'water and electric Depreciation Fund....Sums deposited into such fund shall be expended only for unusual and extraordinary repairs and replacements of the water and electric light works." Both the Charter and ordinance include precise formulas to determine how much money, every year, city government must deposit into the Depreciation Fund. The DCLC heard what group members called "conflicting testimony" about the missing Depreciation Fund at its May 7 meeting. "The City Charter and Code of Ordinances specify a Depreciation Fund," the group told city manager Mike Matthes. "Does the City have a depreciation fund?" But when group members asked "how much money is in it," Matthes went into Bill Clinton mode, reminiscent of the former President's famous Monica Lewinsky response, "It depends on what the meaning of the word 'is' is." "There’s two meanings to the word 'depreciation' in city government," Matthes told the DCLC. "One is defined by the Government Accounting Standards Board (GASB). And one is defined by our Charter. They’re not the same. And so I want to first stress that. They’re not the same thing." City Hall "accounts for depreciation," Matthes continued, but does not have the required Depreciation Fund. "When I used the term 'depreciation' earlier, I was talking about more of the GASB approach to it. We do do that. We account for depreciation." But DCLC members, led by local architect Nick Peckham, persisted. "In fact, Columbia’s City Charter requires the creation of 'an adequate depreciation fund for the purpose of making renewal and replacements,'" they said. "The laws are too old to be obeyed," was the upshot of Columbia finance director John Blattel's testimony. "Chapter 27-44...was passed at least 50 years ago," Blattel told the DCLC. "To our knowledge, there has not been a 'Depreciation Fund' for at least 30 years. Sections 27-42 and 27-43 are also outdated." On David Lile's daily radio show last week, McDavid declined to comment about the missing Depreciation Fund. "I need to read and understand the report," he said, responding to a question from this writer. DCLC members include Realtor Brent Gardner; Boone County Commissioner Karen Miller; Columbia Historic Preservation Commissioner Brian Treece; administrators from Columbia College, Stephens College, and Mizzou; Deb Sheals from the Downtown Community Improvement District; Sara Loe from CoMo's Planning & Zoning Commission; Columbia Housing Authority director Phil Steinhaus; and Tim Teddy, the city's planning and development director.